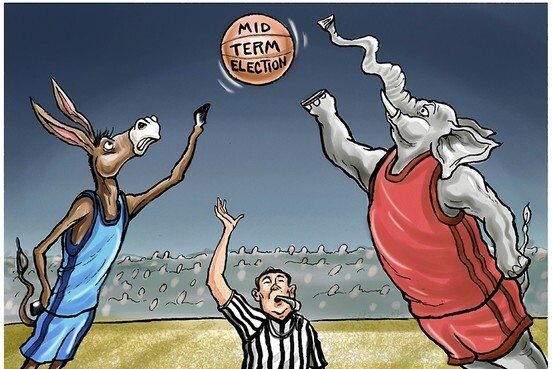 The Wall Street Journal has an early line on the 2014 midterm elections. Though Democrats are hopeful that they hold the Senate but retake the 17 seats in the House, the odds (and history) are against them. Based on historical measures, it would take a massive popular preference for Democrats to overcome their logistical disadvantage, perhaps an almost unheard-of lead of 13 points in the generic ballot questions pollsters use ("will you vote Democratic or Republican for House in the next election?"). Currently, the generic ballot shows a slight Democratic lead of two to three points. But what if the more competitive chamber in 2014 is the Senate? Democrats are defending seats in seven states that Mitt Romney won in last year’s presidential race: Alaska, Arkansas, Louisiana, Montana, North Carolina, South Dakota and West Virginia. Mr. Obama won an average of just 40.5% of the vote in these states. In addition, the retirements of longtime Sens. Tom Harkin (D., Iowa) and Carl Levin (D., Mich.) make those previously safe seats much more competitive. Factor in some freshmen Democratic senators elected from swing states in Obama’s 2008 wave (the last time this batch of seats was contested), and Republicans could run competitive challenges in 10 or more Democrat-held seats. Incompetent GOP nominees could change the picture, but almost all of the seats that Republicans are defending are in solid-red states. The GOP released it’s report about the 2012 election in this PDF. Reince Priebus discusses how to get the GOP back in the political game. According to a new Pew Research poll, only 3 out of 10 Americans trust government. Arthur Brooks writes in the Wall Street Journal an interesting piece analyzing what is really ailing the Republican Party. As you might imagine, he doesn’t put forth the issue of policies as the “number one” issue. His prescription is not to moderate Republican brand, but rather to reemphasize its attention to assisting the needy. The left talks a big game about helping the bottom half, but its policies are gradually ruining the economy, which will have catastrophic results once the safety net is no longer affordable. Labyrinthine regulations, punitive taxation and wage distortions destroy the ability to create private-sector jobs. Opportunities for Americans on the bottom to better their station in life are being erased.